In recent months, the numbers of unaccompanied minors from Central America crossing the U.S. border has surged, drawing both concern and criticism. 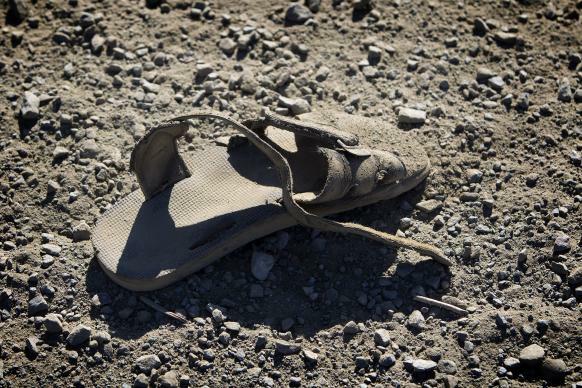 In this file photo, an abandoned sandal lies just across the border from Mexico near Friendship Park in San Diego. The Rev. Sherry Brady, her daughter, Candace, and Barbara Haralson, a deaconess, from First United Methodist Church, Safford, Ariz.; the Rev. Beth Rambikur, First United Methodist Church, Tucson; and Marjie Hrabe, a deaconess from St. Mark’s United Methodist Church, Tuscon,participated in an interfaith training session June 22 sponsored by Casa Mariposa, a Tucson organization that works with detention centers. The session was held at Holy Trinity Catholic Church.